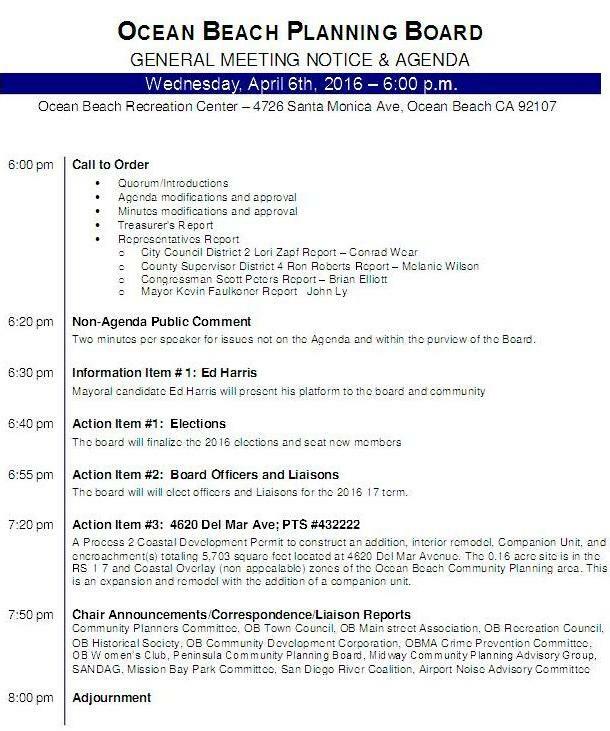 The OB Planning Board – which meets this Wednesday, April 6th – has a full agenda. The Board meeting begins at 6pm and is held in the Community Meeting room of the OB Rec Center, 4726 Santa Monica Avenue. Mayoral candidate Ed Harris will be making a presentation of his platform before the Board and community members who attend. Many Board members have fond memories of then-Councilman Harris leading the City Council in an unanimous vote in support of the OB Community Plan update in the summer of 2014. Harris, jumping into the election fray late, has joined former Assemblywoman Lori Saldana in contesting Mayor Kevin Faulconer for his seat in the California June Primary. The Board will also finalize its annual election results and seat new members. 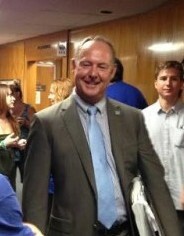 Officers will then be elected by the new Board to the new term, which lasts for one year. Liaisons to the various agencies that the planners stay in touch with will also be selected. 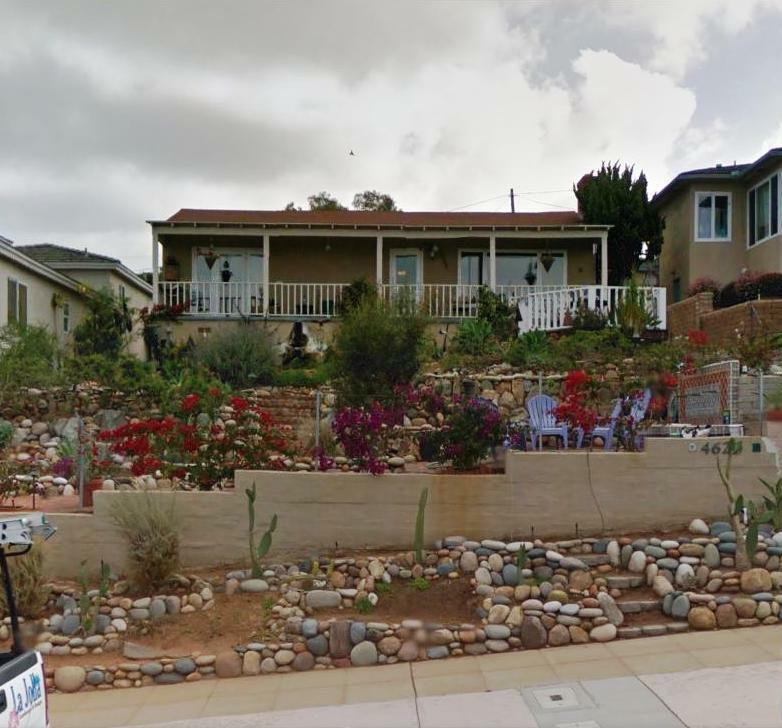 The other big item on the Board’s agenda is a permit to construct a second unit, interior remodel and addition to the first unit at 4620 Del Mar Avenue. Most of Ocean Beach has a floor-area-ratio of 0.70, but at this writing, the FAR for this area and section of Del Mar is not known to this writer. However, by our calculations, there is a concern. Never having been corrected on this point by any OB planners, we still then raise this concern – and again, await to be corrected if we are wrong on this. Here, then is the official agenda. The Del Mar property fails FAR and the planning board should reject it. As for the companion unit, why did the applicant pay a “street address change fee”?. Is that for the mother-in-law, or is it another vacation rental in the making? The lot is currently zoned RS 1-7. FAR for those lots dependent on lot size, in this case, its 7,000 SF x 0.58 FAR = 4,060 SF. Floor area includes garage, and can also include parts of attics, vaulted ceilings, and crawlspaces depending on their size. Companion units are limited to 700 SF in size, require 1 additional off street parking spot per bedroom, and the property owner must sign an affidavit that he lives on site. This area is supposedly changing to RM 1-1 soon. I don’t think that has happened yet. But that allows 0.70 FAR = 4,900 SF. 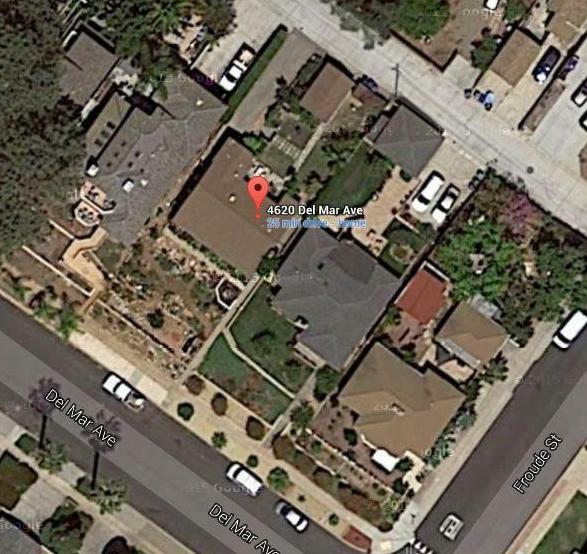 (If you use the 0.75 FAR in the san diego code its 5,250 SF).